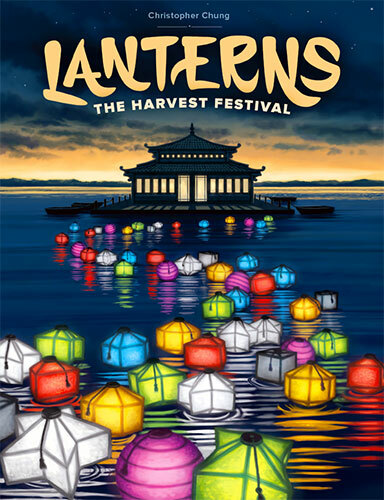 This week I picked up a new boardgame, Lanterns: The Harvest Festival. It's fairly light and fairly inexpensive, and I thought I'd share my initial thoughts. This game is lovely. The artwork is great, the production values good, especially for the $25 price tag, and the theme gives me the warom fuzzies. The premise is that you, the player, are a Chinese artisan preparing for the harvest festival by decorating a lake with paper lanterns. OK, yes, this is very much an abstract game and this theme could have been left off entirely, and it doesn't really feel like you're preparing for some big festival. But the theme lends a lot to the artwork which could otherwise simply be colored squares. Instead of that, you get a game that feels... quaint, and relaxing. Gameplay consists of laying down tiles decorated with 7 different colored lanterns, in order to create combinations that earn you colored lantern cards and favor tokens you can exchange for other coloroed lantern cards. Those cards are the exchanged for "honor" tokens, aka victory points. At the end of the game, the person with the most victory points is the winner. The game takes only a few minutes to learn, but every turn you take affects all of the other players. Each tile laid earns everyone at the table a lantern card, with the player who laid it having the ability to get bonus cards and the afore mentioned favor tokens. This means that in your quest to get the lantern cards you need, you also have to be careful to not hand your opponants the right combo of cards. If you mess up, you could hand them what they need to snag those high scoring honor tokens before you get a chance to earn them, yourself. That's where the strategy comes in. The game takes about a half hour to play and the whole family enjoyed it. It doesn't feel like one of those super competitive, back-stabbing games. While it's possible to block someone from getting the lantern color they need, it's much more likely that you'll accidentally give it to them instead. There are so many colors and tiles and variations on the board that blocking and "take that" mechanisms don't really come into play too much. I think this actually helps the game in terms of its theme, because it feels more in-line with the notion of lazily floating paper lanterns across a calm, serene lake. Cutting your opponant off at every turn would be pretty contradictory to that theme. 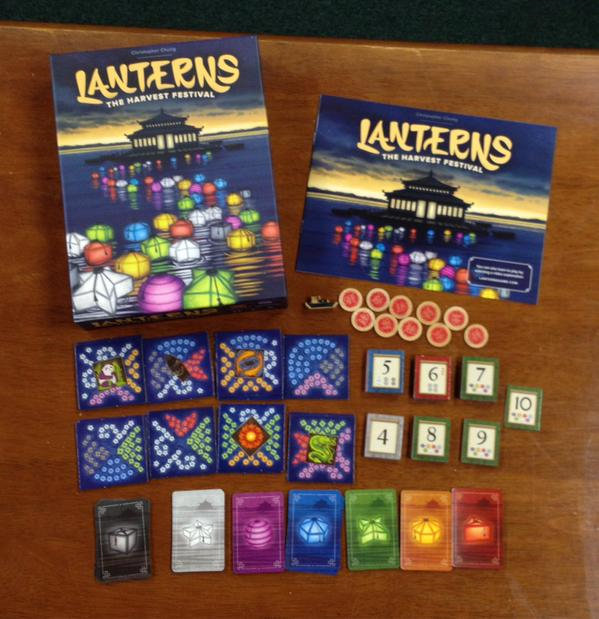 Lanterns is fairly balanced out by the luck of the draw for lake tiles, but we did do some calculations and found that in a three player game, the third player is at a slight statistical advantage. The same is true for the second player in a four player game. It's a toss-up in a two player game. Still, this slight statistical edge wasn't enough to impact game play too heavily nor detract from the fun of the game, but it will likely be enough to make you want to randomize the starting player selection or take turns going first if you plan to play multiple games.